Have you ever thought about what it would be like to smell colors, taste music, or feel a personality? Or to see numbers and letters in vibrant color? This isn’t a weird thing to imagine for everyone – some people, synesthetes, live with those perceptions every day. Synesthesia is a neurological condition where senses are tangled up in the brain so that a sense is simultaneously perceived through one or more other senses. It is estimated that anywhere between one in every 5,000 to one in every 100,000 people have it. This condition has no cure, for neurologists barely have an explanation of where it comes from. It is not debilitating, nor does it have a negative impact on the person who has it. It is actually the opposite – synesthesia makes life just a little bigger and brighter. And I can personally vouch for that. 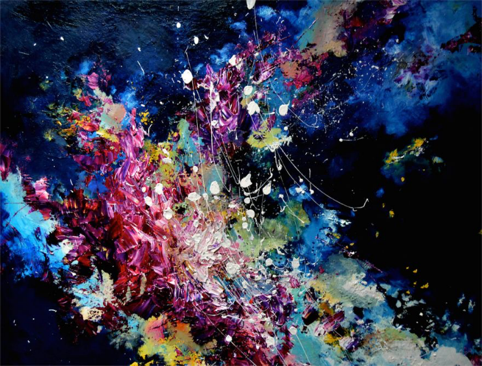 Melissa McCracken, who has music-to-color synesthesia, paints as she listens to music. I have synesthesia, and let me tell you, I was shocked when I discovered that not everyone associated colors with letters and numbers. I thought everyone’s “two” was blue, and everyone’s a was pink. About four years ago, I was doing some research on an artist and I stumbled upon the word “synesthesia.” Intrigued, I clicked on it to investigate and ultimately found out that no, not everyone associates colors with words and letters. I read in the English Oxford Living Dictionary that synesthesia means, “The production of a sense impression relating to one sense or part of the body by stimulation of another sense or part of the body,” which can mean for example, that when one person sees a letter, they automatically associate a color or a personality to it. I automatically identified with this condition and thought it was fascinating. So far, neurologists have found at least 80 different kinds, and after reading about the different forms of synesthesia, I determined that I have grapheme-color, number-form, and personality-color synesthesia. Grapheme-color means that when I see a number, letter, or word, a color is always associated with it. For me, sixes are a purplish, brown color; sevens are bright orange; and the letter s is yellow. Number-form means that I see the names of months and days as if they are floating around me. Depending on the time of year, the word “December” will appear farther or closer to me. For example, in November it seems closer to me; and in June, the word appears farther away. I seem to be able to visualize time as a circle around and in front of me. And lastly, personality-color means that I involuntarily associate a color to people’s personalities. My mom is a hot pink, and my dad is a strong yellow color. We synesthetes go our whole lives thinking everyone is the same way until we find out what synesthesia is. Synesthesia has inspired many authors, artists, and musicians such as Van Gogh, Vladimir Nabokov, and even guitarist Eddie Van Halen. I feel grateful to be in the presence of so many wonderful artists. It’s definitely something that I feel blessed to have and wouldn’t trade for anything since it can make life so much more beautiful and colorful.